Don't know what colors Mako, Lavender, or Tundora are supposed to look like? Want to find out the name of a color that you see on a website? Then Name that Color is for you. This simple tool lets you match colors to names. You can find color names by either creating new colors using the Color Wheel or pasting in the hex code from the CSS of a website. You can also select a color from a dropdown list that has over 1500 color names in it. 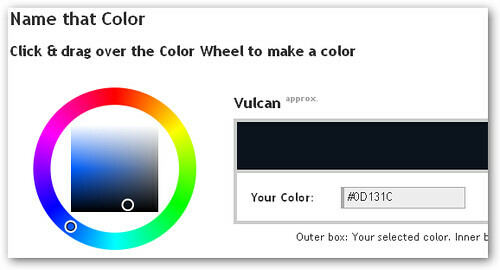 Both HTML hex codes and RGB values are given so you can easily incorporate new colors if you're designing a website.